An ornate building resembling a Spanish palace lies nestled in Balboa Park, an oasis in the southern California city of San Diego. Inside this European architectural marvel lies one of the world’s best collections of South Asian art. The San Diego Museum of Art opened in 1926, and is the oldest, largest and most visited art museum in the region, serving about 250,000 visitors each year. As San Diego is located adjacent to Mexico, the museum’s exhibition text is in both English and Spanish. The museum is most famous for its selection of artworks by European masters like El Greco and Henri Matisse. But, its Edwin Binney 3rd Collection is one of the most comprehensive and high-quality collections of South Asian art outside of India. The collection’s 1,453 works include paintings from the 12th through the 19th centuries, including those created for the Mughal, Deccani, Rajasthani and Pahari courts. The works were created for Indian rulers as well as merchants from Persia, Central Asia and Europe, who travelled to India, set down roots and commissioned art to local Indian artists. The artists were expected to adapt to the whims and aesthetics of their foreign patrons, while maintaining a quintessential Indian quality. The museum has South Asian, Southeast Asian and Persian art galleries, where selections from the Binney collection are always on display. The artworks are organised chronologically as well as by form, like paintings or sculptures, and by theme. The museum strives to showcase the beauty and craftsmanship of the art within the collection, while also informing its viewers about what makes it unique and important. The collection was put together personally by Edwin Binney 3rd (1925-86), an heir to the Crayola fortune. Crayola is known worldwide for its art products like crayons. Rather than acquiring examples of just one era or type of art, Binney sought to collect an encyclopedic range of art from different epochs and schools of painting. Binney also collected objets d’art like Persian miniatures, ballet prints, art from the Ottoman Empire and theater books. He began by focusing on Persian and Turkish art, but as interest in this type of art was widespread at the time, Binney focused on collecting less faddish and, therefore, less expensive South Asian art. 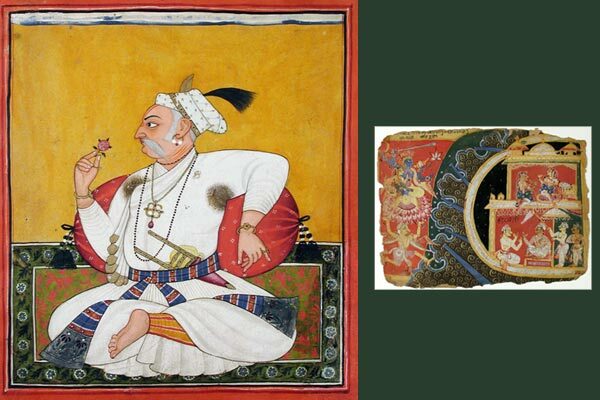 The Binney collection ranges from narrative illustrations of Indian epics to portraits of important personages like emperors, as well as folk art from various regions of South Asia. Not all of the art was intended to be hung on walls. In addition to the massive assemblage of paintings, sculptures play an important part in the collection. However, paintings originally housed together in a single manuscript were removed and sold individually; the text in these large manuscripts was probably destroyed. So, the museum is now trying to preserve the art for future generations to appreciate. Some of the paintings from the Binney collection have appeared in major exhibitions across the United States and in Europe. In addition, selected works have travelled to cities like Québec in Canada, Mexico City in Mexico and Madrid in Spain. In 2012, the museum exhibited 106 works from the Binney collection at the Thyssen-Bornemisza Museum of Art in Madrid. This marked the first time an exhibition of Indian art was organised in Spain. More than 90 narrative paintings appeared at the Princeton University Art Museum in 2016, in an exhibition titled, “Epic Tales from Ancient India: Paintings from The San Diego Museum of Art.” It included paintings from the Bhagavata Purana, the Ramayana, the Ragamala and the Shahnama.